The pantry and refrigerator are like best buds in the kitchen… they share everything at some point. Most of what is in your refrigerator started from the pantry, was cooked, spiced, mixed, baked, tossed, served, and then found a place to “chill out” in the fridge until the next time it is served. Therefore, knowing what is in the refrigerator (both leftovers and cold items) is often vital as to how we stock our pantry. The refrigerator, with all its door shelves and crisper bins, is the easier of the two areas to organize. However, now that you’ve gotten your fridge looking lovely after last week’s Kitchen Organization: Refrigerator challenge, we are ready to tackle that daunting pantry. Since we’re all friends here, I have to be honest… organizing the pantry even seems overwhelming to me. Maybe it’s because I have a super tiny pantry (24”wide x 11” deep). Maybe it’s because of everything the pantry holds. Maybe it’s because trying to do a project like this with kids running around can be hectic. But the end result is sooooo well worth it so please hang in there with me. Here is what our pantry looked like to start with. Boxes turned sideways laying atop other items. Semi-grouped shelves, but lots of stray items looking for an extra spot to sneak in. I always had an “idea” of where an item was, but it was still a search for me. Or if I quickly glanced into the pantry before heading out to the store, I wasn’t really able to get a good picture of the food we had because I couldn’t see it very well. And truthfully, it was just frustrating. After organizing our tiny food space, I feel much calmer when I open the door. I can easily see how much of an item I have because of the wonderful new storage containers I purchased. And you know I love to maximize functionality… so, I have done that in just these few inches as well by adding organizers/drawers. The results have not only been positive for me, but for the whole family! Meal planning is made easier! If you can easily see what items you already have, you can put together meals and plan ahead more efficiently. Family members know where items are. My hubby rarely cooks anything from scratch, but he is sure great at warming things up or making a box of something. By having a pretty consistent pantry, he is not rearranging things trying to find his meal of choice. Likewise, my older two boys love to help. Sometimes I’ll ask them to get crackers or Goldfish out of the pantry. Sometimes they are on a mission to find a poptart for those out-the-door quick mornings. They will often get my protein shake powder out for me while I’m making their meal. 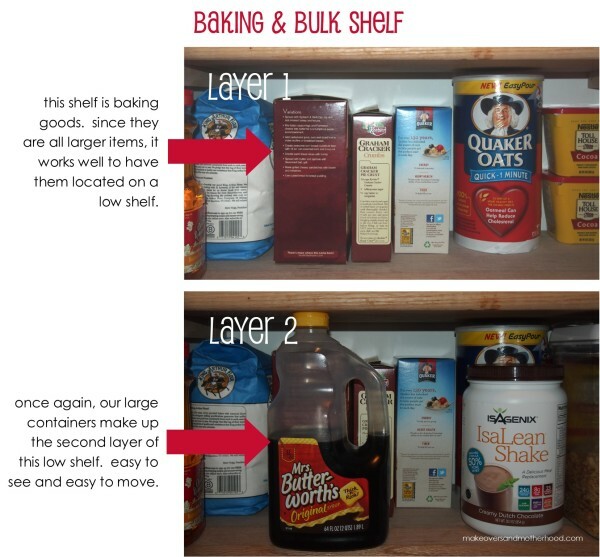 So organizing your pantry in a manner that is thoughtful of your kids’ reach and ability is often a win-win for you too! So let’s stop procrastinating and get busy organizing! Since I can’t be there to walk you through these steps and give you pantry-specific ideas and instructions, I’m going to throw a lot at you. Take it step by step. All of these ideas may not work for you, but pick and choose what will work best for your kitchen and family and go from there. 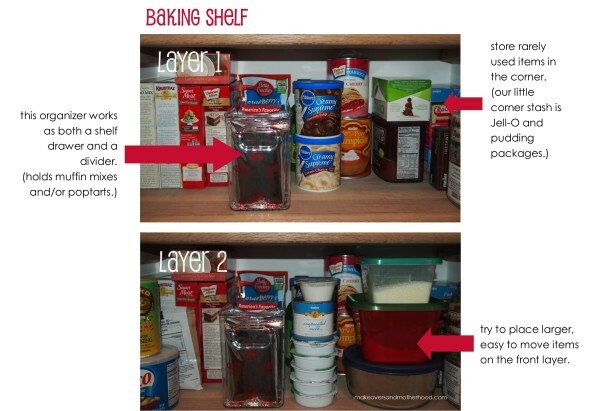 You can also check out my Pinterest “Organization” board for more pantry organization ideas. First things first… make a plan! Do you see a reoccurring theme in how to organize? Always make a plan first. Have a realistic picture in mind of how you want your space to look and function. If you don’t and you just jump right in, you may find yourself feeling frustrated and overwhelmed. Open your pantry and really look at your space. Measure your shelves, take note of what works well and what areas you feel are not being fully utilized. You may want to consider doing a rough sketch on a scrap piece of paper before you tear into the pantry. Remember that we are always seeking the easiest, most convenient, most functional, most efficient way to organize our homes. Don’t make it complicated… make it useable and useful. With our limited space, most of our shelves have a double layer. My suggestion if you do this, make sure the outermost layer is easily moveable. In other words, you should only need to take out 1-2 items to get to the inner layer. Here are some examples of how I have laid out and layered our pantry. Do you have another area in the kitchen that you use (or can use) for food storage? For instance, our pantry shelves are spaced so close together, we cannot store tall cereal boxes here. Our cereal is actually above our kitchen sink where I can reach a large box, but would not be able to reach smaller items.The upper cabinets to each side of our stove are also food storage areas. One of them houses all our spices while the other houses condiments and dry mixes (pancake mix, Crystal Light drink mix, ranch/veggie dip packets). In an effort to declutter our countertop, I had to evaluate both the function of each item sitting out and its visual appeal (we’ll talk more about this next week in the Kitchen Organization: Countertops post). The conclusion I came to was that if I could find a canister set that matched the personality of our home (in other words, looked nice with our decorations), housing the flour, sugar, and brown sugar would be incredibly beneficial in creating more space in the pantry and would have ease-of-use as well. I will rarely suggest adding things to your countertop, but this was actually a wise decision. Most of these items came packaged in awkward air-filled bags or the boxes were of an unstackable size for our small pantry. 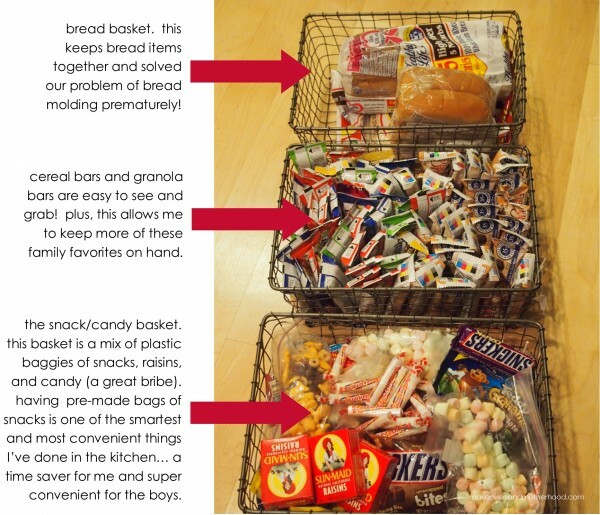 By assigning appropriately-sized baskets to these items, we saved bunches of room in the pantry. Our boys are now able (with permission) to access these handy food items. I feel it has given the boys some independence. They are now able to choose their own snacks (with exception of the candy basket). And, in their offer to help, will often volunteer to get car snacks ready or pull the bag of pretzels out for lunch. Are there any spots in the pantry that are not useful, are awkward to get to, or that are not being utilized completely? What can you do to make them more functional? Would moving the shelf up or down help? Would adding organizing boxes help?I have two types of storage containers for the pantry and I love them both! I have 4 of the Pantry Bins (one holds bottles of vinegar, one holds muffin mixes and our poptart overstock, and the remaining two are dedicated for the myriad number of Ethan’s baby food pouches). I use these like sliding drawers that organize the same type item from front to back of the shelf and are nicely contained! The other organizers I use in the pantry are the Good Grips® POP Canisters. I LOVE these canisters for the pantry! (Side note: Even as much as I love these, I would not choose them as a countertop canister since they are plastic. You can find some classy glass or porcelain ones that would be a better fit for decorating a countertop.) Although there are several size options available, they are designed to the same stacking height and have a nice, tight rectangular fit! They are excellent sealing containers and the sizes are ideal. When shopping for pantry organizing canisters, I was drawn to the round ones. They looked so modern and fun. However, when I considered how functional they would be, these won hands-down. Empty, Sort, Clean! 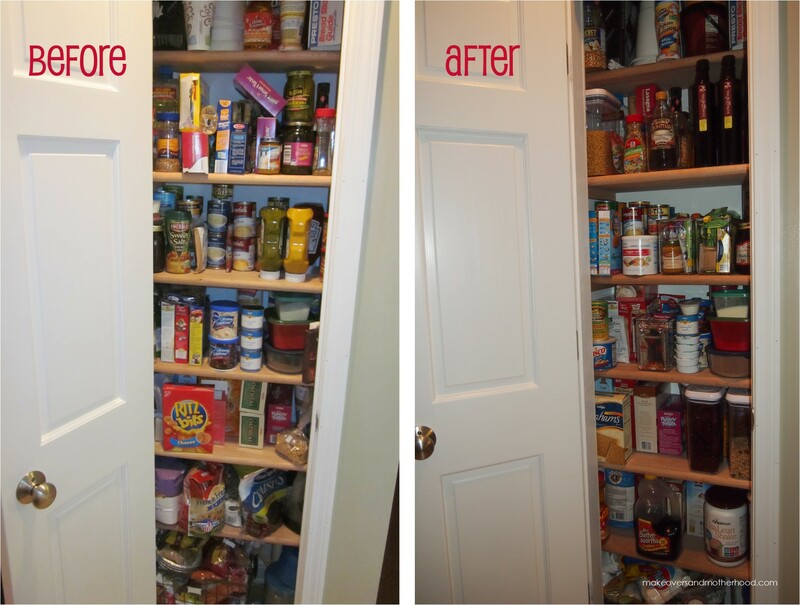 Now that you have brainstormed how to best use your pantry and have made a plan, completely empty the pantry. Start sorting like items into piles/groupings (example: canned goods, pastas, crackers). Then clean it! My pantry shelves never get emptied so this is the perfect time to wipe/sanitize the shelves and clean out any cobwebs. Restock. This is where your creativity and your plan comes into place. Don’t be surprised if restocking each shelf takes a couple tries. Honestly, I organized our pantry for the first time back in March and then decided having more organization bins would be helpful so I did more organizational tweaking to the shelves. Keep in mind that these are consumables you are organizing. 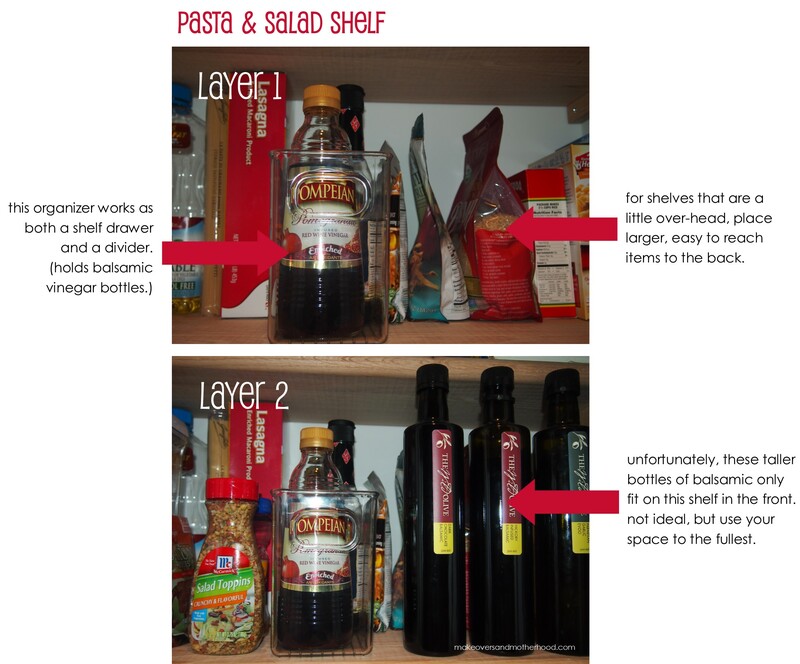 Leave a little wiggle room on each shelf since the items you add/replace may vary. Check the expiration dates on EACH item you put back into the pantry. Make sure to stock like items with the soonest-to-expire items available for use first. If there is a picture on the side of the box, make sure it points out. The same with canned goods, make sure the picture is facing out. This makes it easy for kids (or heck, even us adults) to identify the item without having to read each box. Share with your family how you re-arranged the pantry. 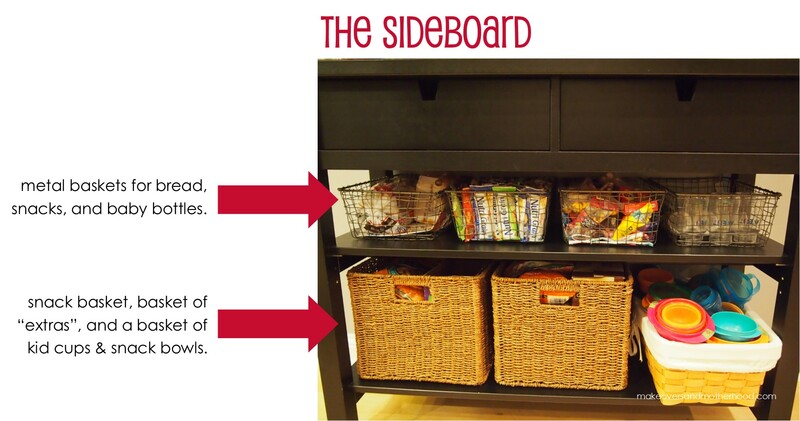 Show them the new snack bin you made for them (filled with healthy, easy-to-grab goodies). Show your kids where they can put their water cups so they can reach them. As your hubby (or whoever else cooks) to try and help you follow this new system. 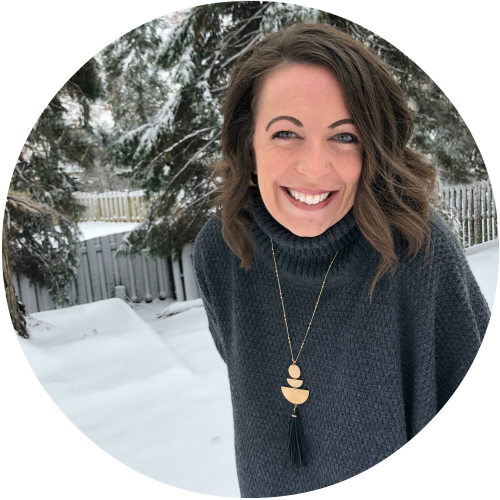 Emphasize how you are hoping to have less food waste and to be better on top of your shopping list and meal preparation this way. Relax with a glass of wine! Organizing the pantry is a big task and you’ll be ready to kick back after this one! Congratulations! 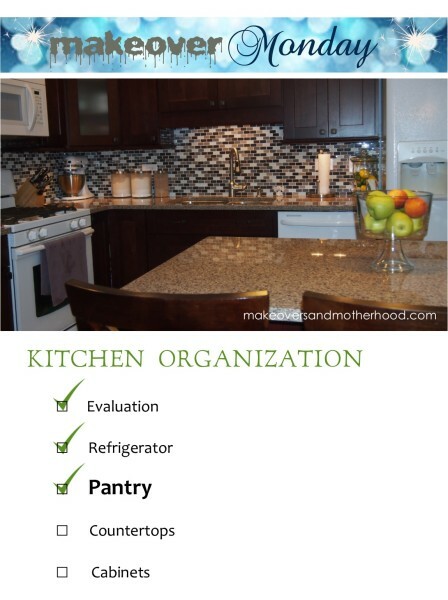 Phase 2 of mission Kitchen Organization is finished! This was the toughest of the kitchen organization projects. You will love how much more simplified meal making will be with this one organizational improvement! Cooking up for next week… Countertop Organization!